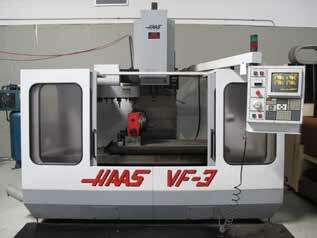 AUCTION DATE: TUESDAY, NOVEMBER 26, 2013 – STARTING @ 11:00 A.M.
1995 HAAS VF3 CNC VMC, CT-40, 20 ATC, 40’’ X 20’’ X 25’’ (XYZ), S/N 4120. 18 ATC, WITH TSUDAKOMA 8’’ 4TH AXIS ROTARY TABLE, S/N M-1095. TURRET 18 X 40 ENGINE LATHE, MODEL PHL-1000, COLLET NOSE, 20-1500 RPM. KALAMAZOO MODEL 9A, 9’’ HORIZONTAL BAND SAW. LAGUN FTV-1 VERTICAL MILLING MACHINE, WITH P.F. TABLE. HILL BROS HORIZONTAL TANK AIR COMPRESSOR. DENNISON HYD C FRAME PRESS. OVER 30 CT-40 TOOL HOLDERS, CARBIDE INSERTS, TOOLING, END MILLS, CUTTERS. PIN GAGES, HEIGH MASTERS, ANGLE BLOCKS, V BLOCKS AND ETC. DUMORE TOOL POST GRINDER, BUX MAG DRILL, VISES, ROTARY TABLES, ETC. PALLET RACKING, LIGHT DUTY SHELVING, AND OFFICE FURNITURE. OVER 140 SETS) “NEW” ROTARY TECH 1223M FLY MILLING CUTTERS.